Grit-like cragging on a stack! It takes quite a bit of effort to write up your routes and lets face it most of us can’t be arsed. So when someone who visited here on holiday emails me not just offering some write-ups but a full-on miniguide for a sea stack I was pretty happy! I was expecting some chossy sandstone rubble strewn stump hard to get to and long way from anywhere. Not so! This little gem was “found” by Chris and Liz Ford while on a trip here this August. The climbs are up to 10m but mostly to 8m so fairly short and some could even be bouldered or just soloed but the lines are really compelling. Chris and Liz climbed 8 of the most obvious ones up to VS but there’s still more to do. 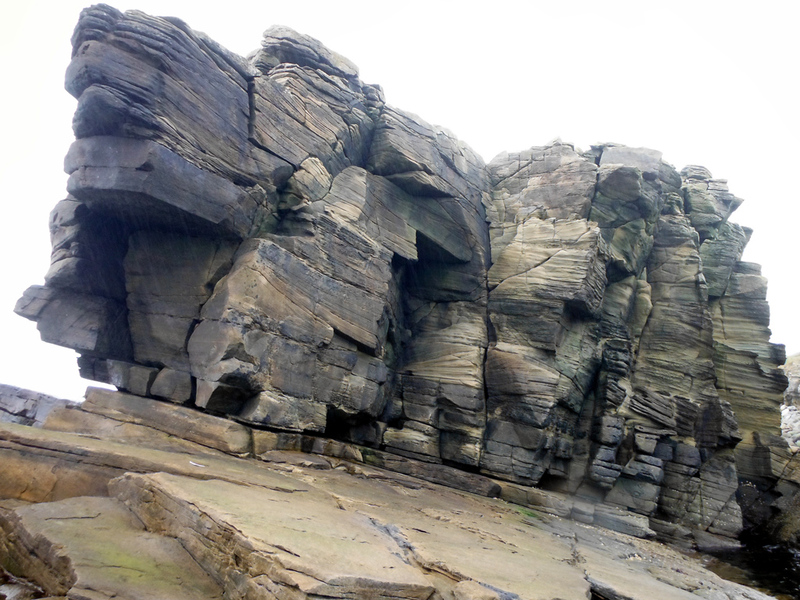 The sea stack is accessible a few hours either side of low tide by a series of tidal stepping stones, and then a short hand traverse / big step onto the stack. This is a little awkward at anything apart from low tide. 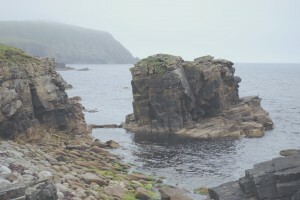 You’ll want fairly calm conditions too, as the slabs around the stack are pretty lethal when wet. To beat the tide problem it would be pretty simple to set up a short tyrolean back to the land for your retreat, or just accept that you’re going to get a bit wet on the way back! To get there, park at the Sumburgh Hotel, and walk down the ramp and to Jarlshof. Then follow the coast south for 5 minutes to the stack. It’s very sheltered from bad seas except from the South – anything more than a 2m swell coming in would make it difficult to climb most of the routes. There might be a few more routes on cliffs between the stack and Sumburgh Head but this hasn’t been explored yet. I went to take a look at the stack the other day after coming back on the plane and it wasn’t a day you’d normally want to climb, but the rock was fine, just a little damp, leaving me thinking that this could be brilliant winter venue as there’s not going to be much seepage (no grass on top to hold water). Knowing our luck there will be a spring coming up in the middle of the stack just in Winter, but hopefully not! Take a look at Chris’ superb miniguide here for more info (PDF). I’ll create a crag page for the stack soon. Looking at the guide and after heading out there. The bigger south wall actually only has one route up it surprisingly so these are still to do.